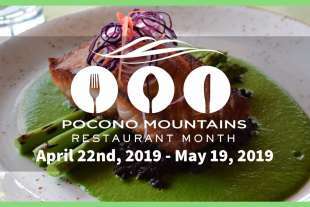 Pocono Mountains Restaurant Month, "Taste of the Poconos" takes place April 22 to May 19, 2019! Pocono restaurants run the gamut from ethnic favorites like Thai to Italian, fine dining four-star cuisine to down-home family cooking. The region&apos;s evolving restaurant scene goes well beyond a deli and cafe and brew pub or bar & grill. Expect the extraordinary in the Pocono Mountains, whether it&apos;s organic, local game, Chilled Strawberry & Rhubarb Soup or Roasted Lobster "Newburg". Poconos chefs use flair and creativity to produce delicious dishes. There are several local farm to table restaurants, and the Pocono Mountains&apos; downtowns are a great spot to relax at one of the many sidewalk cafes. Many restaurants also feature live music from jazz to acoustic. Restaurants in the Pocono Mountains can accommodate everyone&apos;s taste and appetite. While here, visit a bakery for that special treat or make plans for your special event at a unique location. When enjoying the gaming scene, grab a bite at one of these casino dining options.